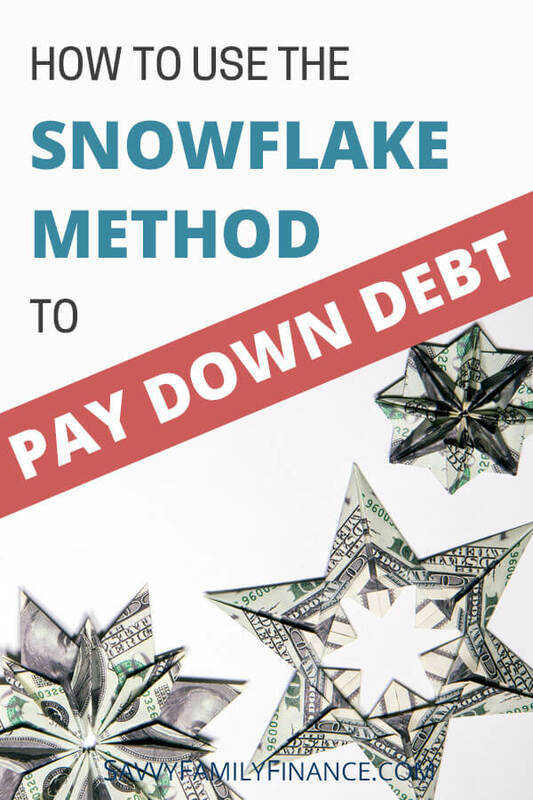 Inside: Discover how the debt snowflake method works and how it can help you pay down debt faster. Hate the feeling of being bogged down by debt? There are ways to pay down debt faster, whether it be a debt snowball or avalanche. But what if you want to do more, no matter how small? There is a way to chip away at your debt so you can get rid of it sooner. It is known as the debt snowflake method. How does the debt snowflake method work? Is using the debt snowflake approach effective? The snowflake approach is a variation on and an excellent complement to the debt snowball and other debt payment plans. In a debt snowball, you organize your debts from smallest to largest and work on paying down debts one at a time. The snowball method, and most other debt payment approaches, are part of your monthly budget. They are planned payments. With the snowflake approach, you make payments on your debt using any extra money you find. It may be $4 here, another $2.50 there, but it all adds up if you capture the savings and apply it. Snowflakes are small but mighty. In our city, a few snowflakes can shut down the town. Once the weather warms, though, they disappear quickly. So use the power of micro-payments to help pay down your debts even faster before you end up spending the money on cupcakes or buying a new game for your phone. Now you know that you use any extra money to make snowflake debt payments. What does that look like in practice? One way to find snowflake money is by cutting back on your spending, whether on purpose or accidentally. For example, if you spent less on groceries for the week than you anticipated, you put the leftover money toward your debt. It’s not a big payment, but a snowflake payment. Making your own drinks rather than buying. Whether it is coffee or cocktails, you can pocket the money you would normally spend on drinks and apply it to your debts. Even if you only do this once a week, it helps! Go to the library. Your local library likely has more than books. Check for DVDs, CDs, online ebooks, magazines and audiobooks, and sometimes even streaming movies. The money you would normally spend on a magazine, book or video rental you can likely get for free at your library and then the money you don’t spend (that you were planning to) is yet another snowflake payment. Another way to find snowflake money is by earning more money. If you have a bag of cans and bottles, then return them and get your deposit back. Use that money as a snowflake payment. Drowning in clutter? Selling a few things on Craigslist or Facebook Marketplace can generate cash. Ideally, as soon as you have the snowflake money, you would apply it to your debt. That may become overwhelming or incur fees if you are transferring money multiple times a day. If not, then go ahead and do that. Another way to capture the money is to set up a money jar. All your spare change, found money, extra unbudgeted income and savings, which you can write on a piece of paper as an “I owe me,” get put into the jar. At the end of the week, this snowflake money is applied toward your debt payments. The debt snowflake approach acts as a psychological motivator. You’ll find yourself always on the lookout for spare change you can put towards your debt. You may even find yourself actively trying to spend less so that there is extra money available to pay down debts with the snowflake method. Financially, your extra money is put to good use. The extra debt payments help reduce interest payments and help accelerate your debt snowball, avalanche, blizzard, or dartboard payment plan. (Ok, I made up the “dartboard method”, but I think you get the idea). The idea that such small amounts could make a difference to your debts may seem laughable. But don’t be fooled. Remember, a few snowflakes can shut down a city. They have power. For example, say you have a credit card with $5000 left on it at 18% APR. If your minimum payment is $200, it would take you 30 months to pay off the balance and you would pay $1,314 in interest. But, if you managed to scrape together a total of $20 extra each month and apply that to the car loan, you would be done 4 months earlier and pay $1,160 in interest, saving you $154. That may not seem like much overall, but I’m betting you can think of something you’d like to do with that extra $154. The debt snowflake approach is great because it helps you realize you can act on your debt every day. It is one small thing you can do that makes a difference.